Beebe Healthcare recognizes National Cancer Registrars Week, April 6-10. This recognition followed a proclamation made by Gov. Jack Markell also recognizing the week. Cancer registrars are data information specialists responsible for capturing information about every cancer patient. This information contributes valuable information to researchers, healthcare providers, and public health officials to better understand, diagnose, and find a cure for cancer. The Beebe Healthcare Cancer Tumor Registry, located at Tunnell Cancer Center, consists of four registrars. Please join us in recognizing them. This week highlights the important role that professional cancer registrars play in capturing data to inform cancer research, prevention, and treatment programs, reads the proclamation. 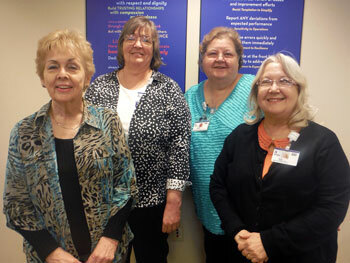 Caption: Shown (left to right) are Helen Moody, Lead Registrar, CTR; Susan Cadwallader, CTR; Mary Lachmann, Registry Assistant; and Marie Michael, Registry Assistant.